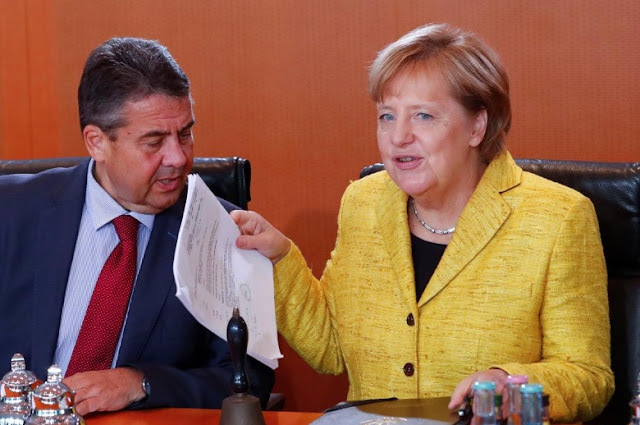 German Foreign Minister Sigmar Gabriel and Chancellor Angela Merkel attend the weekly cabinet meeting at the Chancellery in Berlin, Germany, September 27, 2017. BERLIN - Germany is worried that U.S. President Donald Trump will say the international deal to curb Iran’s nuclear program is not being adhered to and that this will turn North Korea off any accord to halt its nuclear weapons program, the foreign minister said. Germany is worried that U.S. President Donald Trump will say the international deal to curb Iran’s nuclear program is not being adhered to and that this will turn North Korea off any accord to halt its nuclear weapons program, the foreign minister said.